“Correct,” said Remini. “I know what my former church...how they deal with people who tell their story, and so I wanted to be the one to say it.” Harris reported that on Tuesday, representatives hand-delivered a package containing damning statements about Remini to ABC News. Remini told a story about being invited to Cruise’s by a church official, who told her that Cruise wanted her to teach him salsa dancing. At Cruise’s, she said she saw two “high-ranking Scientology officials,” along with his then-girlfriend Katie Holmes. “He was, like, forcibly kissing Katie,” recalls Remini. “I said, ‘Hey, get a friggin’ room.’” Remini says one of the officials present wrote up a “knowledge report” on her that she then had to answer to in an audit. “If you say something critical to the church, you will be written up,” she says. “We’re like, ‘Interesting song to sing to your bride,’” Remini says was her response. Scientology leader David Miscavige, Remini claims, attended the wedding without his wife, which the church calls, along with the rest of Remini’s recent claims, “ridiculous and stupid.” Remini says she was punished for the ensuing knowledge report she filed, and Holmes herself responded to Remini’s behavior at the wedding in her own knowledge report. 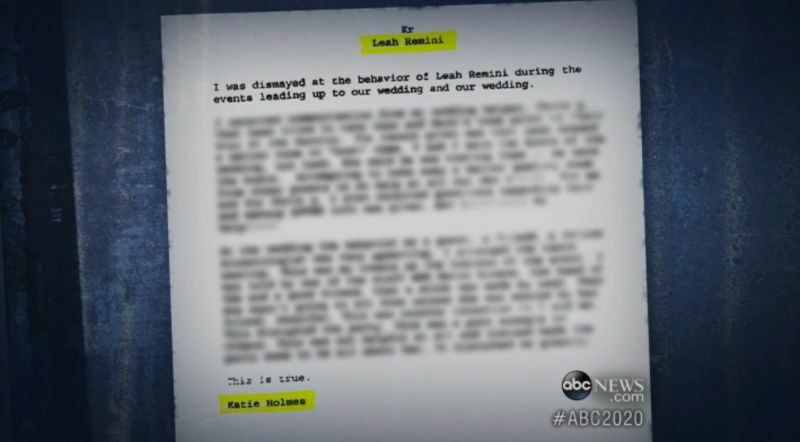 Remini read from what she said was Holmes’s letter: “I was dismayed at the behavior of Leah Remini during the events leading up to our wedding and our wedding. The behavior as a guest, a friend, was very upsetting.” In various reports, Remini was charged with being loud, late, and rude at the wedding. She was also accused of upgrading her hotel room and switching seats at the reception.